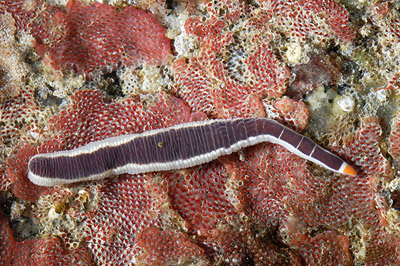 Purple Ribbon Worm (Micrura verrilli). Nemertea, also called Nemertin(e)a, are a phylum of soft-bodied worm-like animals known as ribbon worms or proboscis worms. About 1,400 species are known; most are marine, but some are freshwater, and a few live on land. Most species grow to a length of 20 millimeters (0.8 inch) but one, the Bootlace worm Lineus longissima, attains a length of 55 meters (180 feet), making it one of the longest (if the not the longest) animals known.